In the early morning of March 6, 2013, Fr. 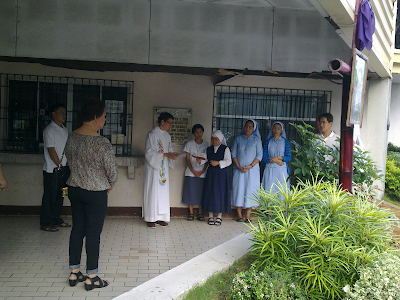 Luke, together with the members of the Construction Committee, the religious community and other massgoers, trooped to the multi-purpose hall for the blessing before the renovation work officially began. After a short prayer and the reading of the Gospel, Fr. Luke went around the hall blessing all the spots where the main structural posts would be erected. The plans for the renovation works will replace the current roof of the multi-purpose hall with a new one, provide additional parking spaces by recessing by 3 meters the side adjacent to the road, and erect a mezzanine floor which , in the future, would be able to provide additional meeting rooms for the growing needs of the parish. The renovation works, with the perspectival design and visualization provided by Arch. Mike Padre, will be undertaken by Bro. Laya Victoria and is targeted to be completed by May 1, the feast of St. Joseph the worker.